Combine the chicken stock and dried mushrooms in a pan and bring to a simmer. Bubble gently for 10 minutes to rehydrate the mushrooms and flavour the stock, then remove with a slotted spoon, squeezing them out as you do. Chop roughly and set aside. Add 80g of the miso to the pan and whisk to dissolve, keeping the broth at a low simmer. Meanwhile, bring 2 litres water to the boil in a separate saucepan. Finely slice the green parts of the spring onions and set aside. Coarsely chop the white parts. Put the 2 tbsp oil in a frying pan over a low-medium heat and add the garlic, frying slowly until golden and crisp (take your time with it; don’t let the oil get too hot or it will burn). Remove the garlic from the oil with a slotted spoon and drain on kitchen paper. Return the pan to a high heat and add the sweetcorn. Cook for 3-4 minutes until browned, then remove with a slotted spoon and set aside. Add a little more oil to the pan if needed and return to a high heat. Add the spring onions (white parts) and the red onion. Fry for 4-5 minutes until starting to colour, then add the anchovies and mash into the oil using a spatula. 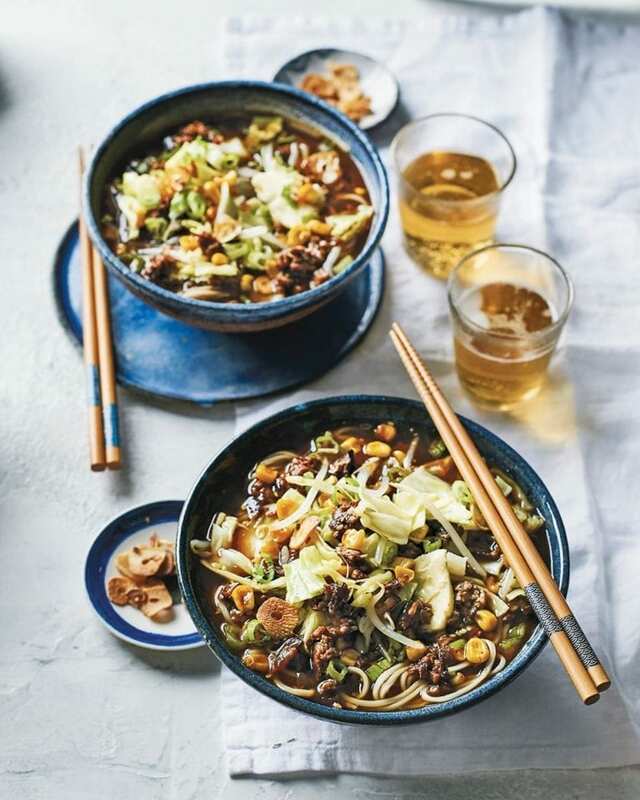 Add the pork mince, chilli flakes, sesame seeds, pepper, remaining miso and the mushrooms, then stir-fry for 8-10 minutes until the pork is cooked through and slightly browned, breaking up any chunks of mince or miso. Remove from the heat. Blanch the cabbage and beansprouts in the pan of boiling water for 30-60 seconds, then remove with a slotted spoon to a bowl and toss with the sesame oil. Cook the noodles in the same pan of water according to the pack instructions. Stir the broth, then ladle into 4 warmed deep bowls. Drain the noodles and divide among the bowls, top with the other ingredients and, finally, add the butter just before serving so it doesn’t fully melt before it gets to the table. Complete the recipe to the end of step 3 up to 48 hours ahead. Keep the broth, mince, garlic, spring onions and sweetcorn in separate airtight containers in the fridge. Reheat the broth and mince separately, then complete the recipe from step 4 to serve.